I grew up on the Australian coast in the time that Jaws hit the cinemas. The lurking terror it represented was real to us. Especially in the long summer holidays, spent with friends at the beach. The shark spotting helicopters patrolled overhead and the sirens evacuated us from the ocean when a nearby shark ventured a little close. We all knew we were in their world and we respected the sea, with its beauty, danger and creatures. Sharks are incredible and they have been the victims of some pretty scary PR. 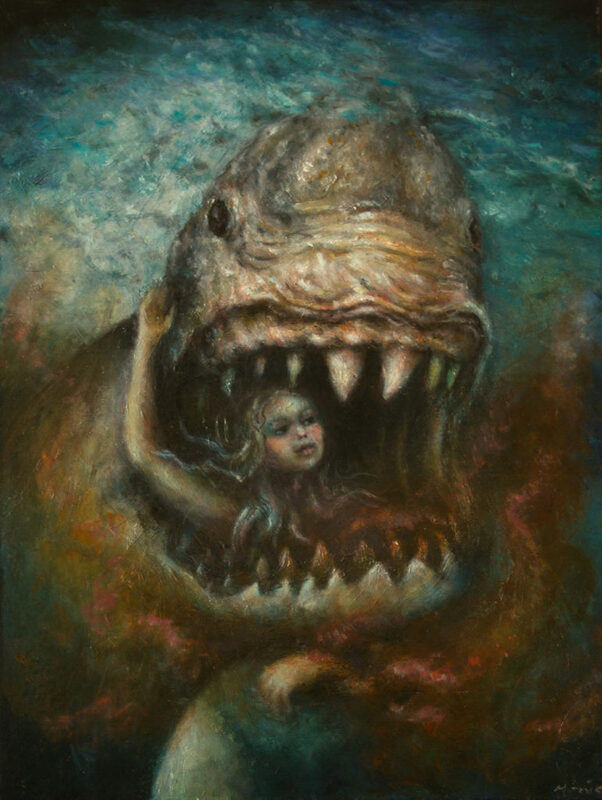 It is for all these reasons that I painted “A Bite to Eat” as my Tiny Terror it is oil on wood and not surprisingly, it is tiny at 8 x 6 inches. Is seems appropriate that the show is opening in the same month that I qualified as a PADI open water scuba diver. I have already planned my next watery adventure, it will be back in Australia, at The Great Barrier Reef.